I have never watched a single episode of the TV series “The Walking Dead”, and I don’t recall buying or reading the comic book (graphic ‘novel’?). 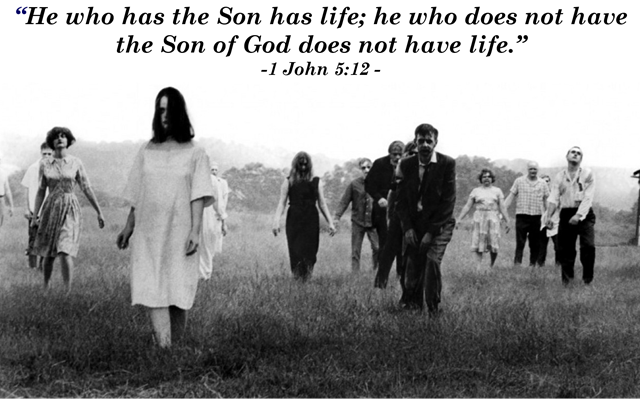 In fact, I don’t think I ever watched “Night of the Living Dead” back in the late sixties. I just thought that the movie (pictured above) was well, stupid (nothing personal). My opinion of the genre has never changed. Grammatically speaking, you might be right. You might think that living apart from Jesus Christ just means living this life separated from God, or without a relationship with God. And we all see people we know are living a ‘good life’, temporally and materially speaking. Maybe you’ve already tried to witness to someone you know who is living that ‘good life’ without Christ and found it to be a challenge. After all, it’s easier to share Christ with someone NOT living a great life down here. Maybe you hesitate to share Jesus with those who seem to lack nothing in this world because the chances of ‘success’ (a decision) are slim. Do you know any of these folks? I hope things are well with you and yours!